An atomiser is a clever piece of kit, that turns your e-liquid into vapour for your vaping pleasure. 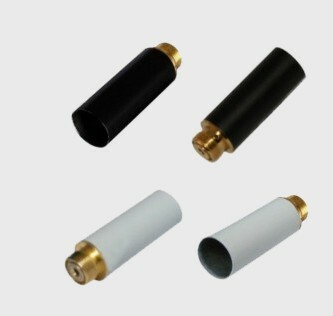 This atomiser works with all 510 cartridges and is available in black or white. To get the best from your new atomiser, ensure you keep it moist at all times (you can use e-liquid on the wick to do this). 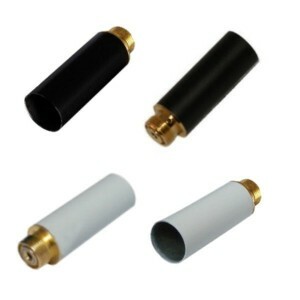 This is the perfect replacement or upgrade for those using a 510 e-cigarette. Switching from tobacco ones to Aussie e-cigs will definitely improve your smile. Tobacco smokers often have yellow stained teeth and are more likely to develop gum disease, bad breath and other dental problems. After switching to them the yellow nicotine stains will slowly disappear from your teeth and they will start to look cleaner, whiter and be generally healthier. As well as this, you won't be inhaling smoke anymore and so your breath will smell much fresher. Smoking tobacco ones affects your complexion making skin look dull, dry and pale. It also makes you more likely to experience acne breakouts and slows down the healing of blemishes. This is because nicotine narrows the body's veins so less blood can reach the skin. This means that skin is not getting all the nutrients it needs which, results in premature aging and wrinkles such as loose skin around the eyes. Switching to them means that your skin will slowly start to appear more vibrant, you will have a clearer complexion and you skin won't age as quickly. Smoking tobacco ones can make the skin on your hands and nails appear yellow in colour. Nails can also become malnourished and weaker so they will break more easily. After switching from tobacco ones to e-ciggies, your hands and nails will begin to take on a healthier appearance and yellow tobacco stains will slowly disappear. As well as this, the smell of smoke on your skin will disappear and you will have beautiful hands to be proud of. Smoking tobacco can damage hair follicles making your hair appear thin and brittle and can even lead to hair loss. This is because smoking tobacco restricts the amount of nutrients reaching your hair so it is not able to grow as well. Switching to ecigs will mean that your hair will eventually begin to feel stronger and thicker. As well as this your hair will smell cleaner as the offensive smoke smell from tobacco ones will no longer be able to cling to it. Smoking tobacco ones can make you feel tired and sluggish, but making the switch to e-ciggies can give you an increased energy level. This extra energy should enable you to go out and exercise and burn calories off leading to a fitter and healthier body.